Note that not all rats (whether male or female) will accept a cage mate. If a slow introduction does not improve their relationship or aggression, do not force it. 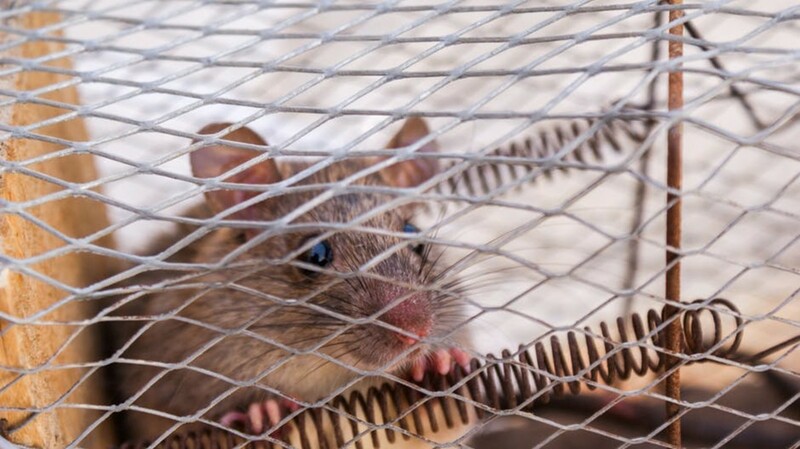 Aggressive rats can cause serious harm if they view another rat as a threat. Rats make great pocket-sized pets for people of all ages. Rats are social animals and thrive with companions in pairs or groups. This is easy when buying or adopting rats from the same litter that have already bonded. But creating friendships between new rats is not always simple. 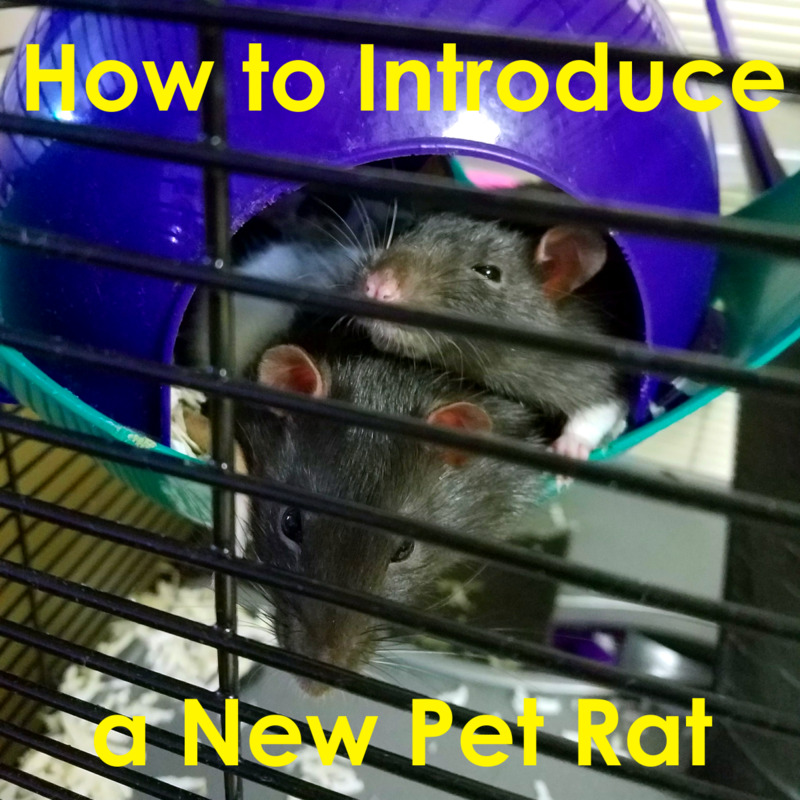 Rat owners sometimes need to introduce a new rat to an existing rat or group of rats. By following a step-by-step process, rats can be introduced safely and without injury. During this time, you can still interact with your new rat, but keep an eye on their health. Is your newcomer’s nose wet, or crusted with red discharge? Rat noses are naturally dry, and wetness can be a sign of illness. Rats have sensitive respiratory systems and are prone to respiratory illness. An excess of red mucus around the nose and eyes may be a sign of stress, especially after moving to a new environment. But, red discharge can also signal illness if constantly present. Do not confuse the red mucus with blood, but keep an eye on it all the same. After quarantine, the next step is placing its cage side-by-side with the resident rat cage. The cages should be far enough apart that the rats cannot reach each other. This allows the rats to smell and see each other, becoming accustomed to each other. Sense of smell is a big deal to rats, and is much stronger than their eyesight. Rats have different personal scents, like any other animal. Female rats often “scent-mark” the cage, especially if another rat has urinated there. Sometimes rats will mark you because you smell like another rat! Did you know that you can help introduce your rats by letting them run around in the other's cage? 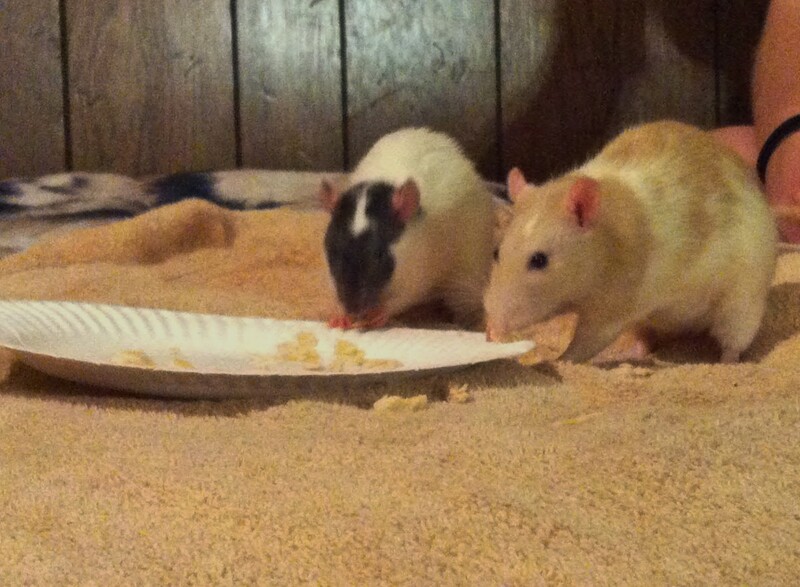 Letting each rat explore the other's smell helps familiarize the scent and helps them become friends! How many rats do you have? I don't have any yet! I have two adorable ratties! I have three or more, a rat colony! The rat cages should spend at least one week next to each other, every hour of every day. The rats need to become used to each other’s scents so the newcomer smells less like an impostor and more familiar. The rats should be curious about each other, sniffing and looking at each other. 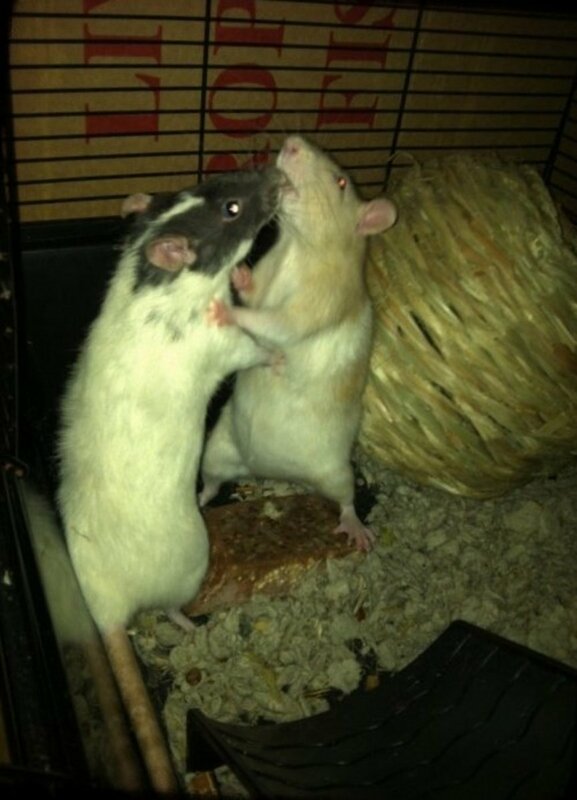 If one of your rats is showing aggressive behavior or hissing, proceed with caution. The rat may have an aggression toward other rats, and may be less likely to accept another cage mate. A few days after placing their cages together, you can have a play date between your resident and new rats. The first introduction should take place in neutral territory to avoid territorial behavior. Neutral territory is a place where your resident rat or rats do not usually play. A common compromise is the bathtub, but can also be the bed, the couch, or anywhere that the rats do not hang out. The bathtub was the best neutral ground for us, and should be harder for the rats to escape from. When having a first play date, have something soft (like a towel) along the bottom of the tub. Place plenty of tempting treats in the middle for the rats to share. 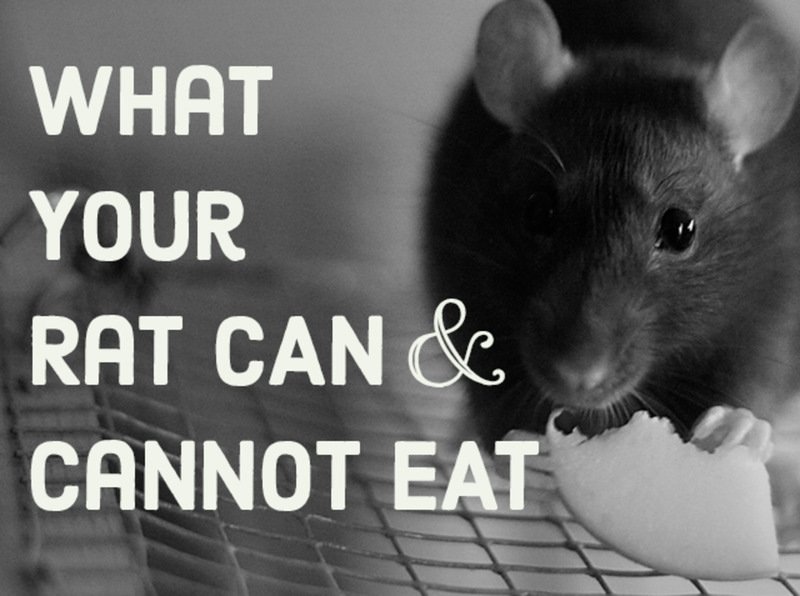 Rats love treats, and eating them together is a great way for them to bond! There is a method on YouTube called The Glove Rat that helps when introducing new rats. It's great for when one or both rats seem jumpy, nervous or aggressive toward the other. In the video, a woman follows the rats around with a gloved hand while keeping close watch on their behavior. The goal is to deflect negative confrontation between the two rats, such as biting. If you get the sense that the rats are going to get into a fight, you place your gloved hand between them and break it up. The glove is there for your own protection, and makes the process feel less nerve-wracking. See the Glove Rat in Action! Watch the play date and follow your gut. If you think one of the rats is taking it too far, separate them. And the first few play dates should be short. Fifteen minutes is enough for the first few days, and you can introduce them as many times as you prefer each day. As the days pass, the rats should know each other more and be less nervous. If you have an aggressive rat on your hands, give them some space before you try again. Once your rats are making progress, you can introduce them in familiar territory. Familiar territory is a place where the resident rat likes to play on occasion. This is different because your resident rats will feel territorial about their location. This place can be the bed, the sofa, or anywhere your resident rat might consider their own. The interactions between the rats here can be more tense than in neutral territory. Having keen eyes and using a gloved hand are very important in familiar territory. Your resident rat may feel the need to guard their territory, and more dominance fights may occur. Watch that neither rat is aggressive toward the other. If behavior escalates to a violent level (or if you feel the need to separate them), end the session. You can always give it another try later. If play dates in the resident rat’s territory aren't going well, have the sessions on neutral ground again. You can repeat this until you feel that the rats can move up to familiar territory. Do this as many times as you deem necessary. Depending on your rats and their personalities, this step can be simple or take several tries. Need a new rat cage? Multi-level cages give rats room to play and live comfortably. I use the same style of rat cage (store brand) for my fur babies. And for the price, this cage is a steal! When your rats have bonded enough to share a cage, you can do one of two things. You can house the rats in a brand new cage, or move them into one of the cages either rat has been living in. Moving the rats into a preexisting cage involves a lot of cleaning, rearranging, and time. Save this step for a day when you plan on being home so you can watch the rats. And if you do it in the morning when your rats are sleepy, it can ease the process. For this step, I cleared off the bed and let the rats play while I cleaned. I had a towel, play tube, toys and treats on-hand to keep them occupied. I decided to house both rats in Patches' cage. I had to clean her smell out and make it seem new and unfamiliar. You’ll need to clean the cage from top to bottom, throwing out all the old bedding and food. 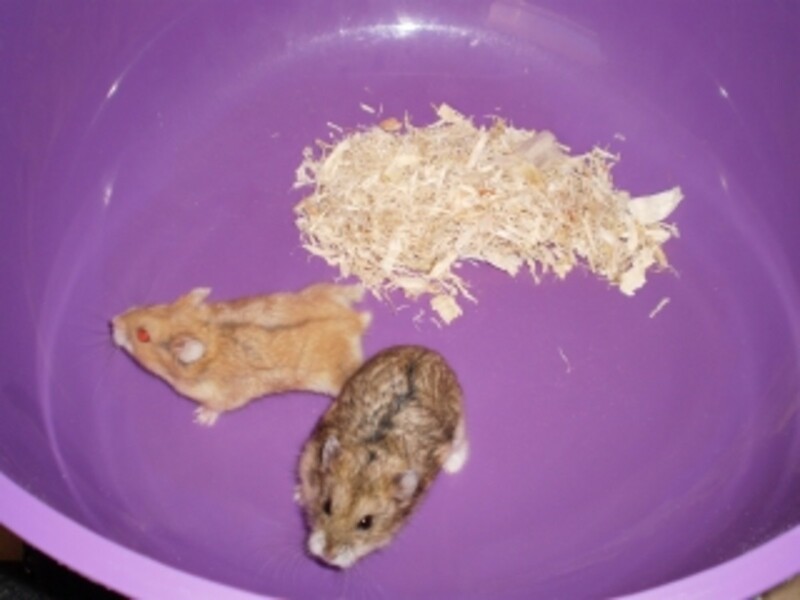 Use a pet cage cleaner from the store that both cleans and deodorizes the cage, and be as thorough as possible. After wiping down the cage and any other objects inside, rearrange everything. If you have a multilevel cage, move the shelves around. Change where the food and water are located, as well as any detachable ledges or other objects. 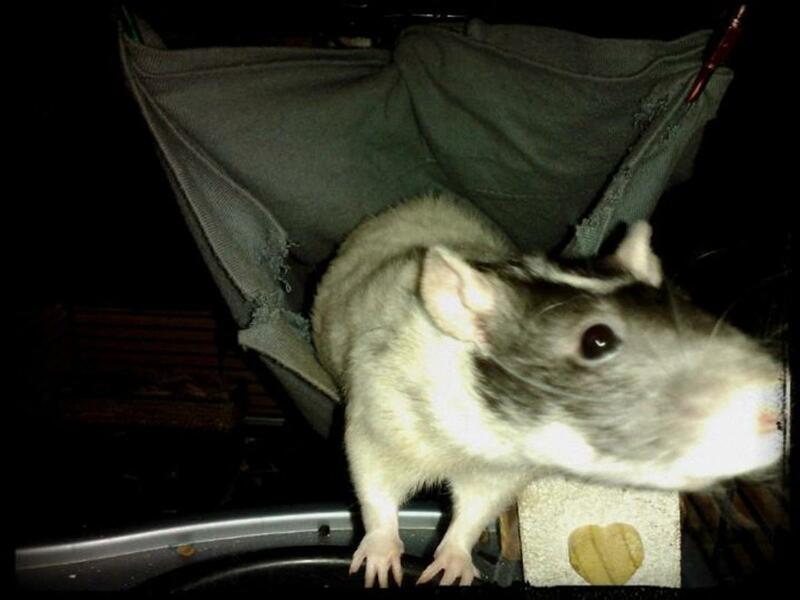 If you have hammocks like my rats do, wash them and re-position them. The cage needs to look new to both the resident rat and the newcomer. It cannot smell like the resident rat, or they will defend it like it is their territory. 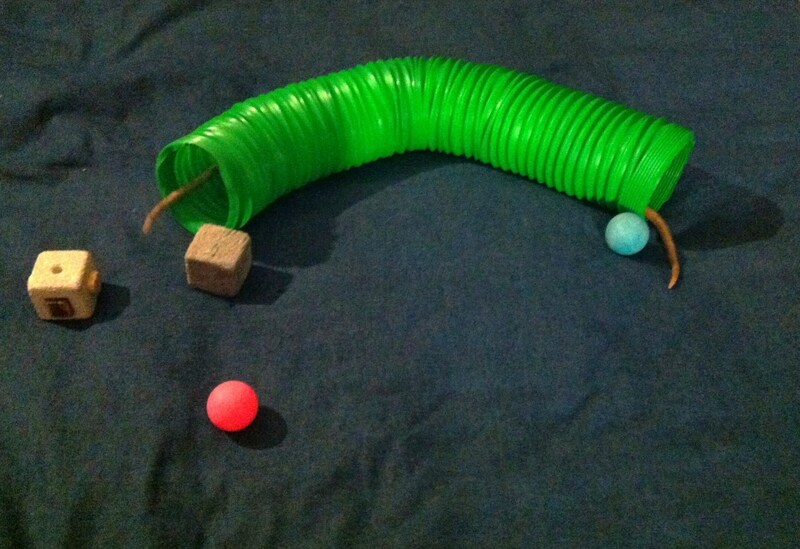 It helps to disorient the resident rat by adding new toys and accessories to the cage that neither rat has seen. Once this is all done, you can let the rats explore. As with the play dates, expect more dominance scuffles started by either rat. If the process has gone well, the rats will eventually become good friends. The struggle for dominance will always be present, as one rat will always seek to be dominant. Wrestling and boxing are ways that rats like to play, so don’t worry unless you spot injuries or if a rat vocalizes pain. Remember: in the end it comes down to your gut. If you feel the rats aren't being friendly, then they may need more time apart. 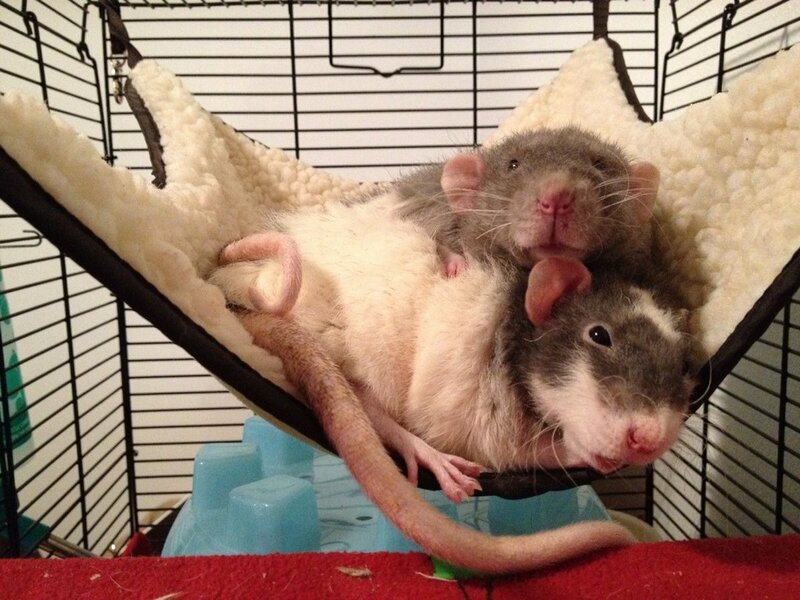 The truth is, most rats enjoy companionship and can become best friends over time. 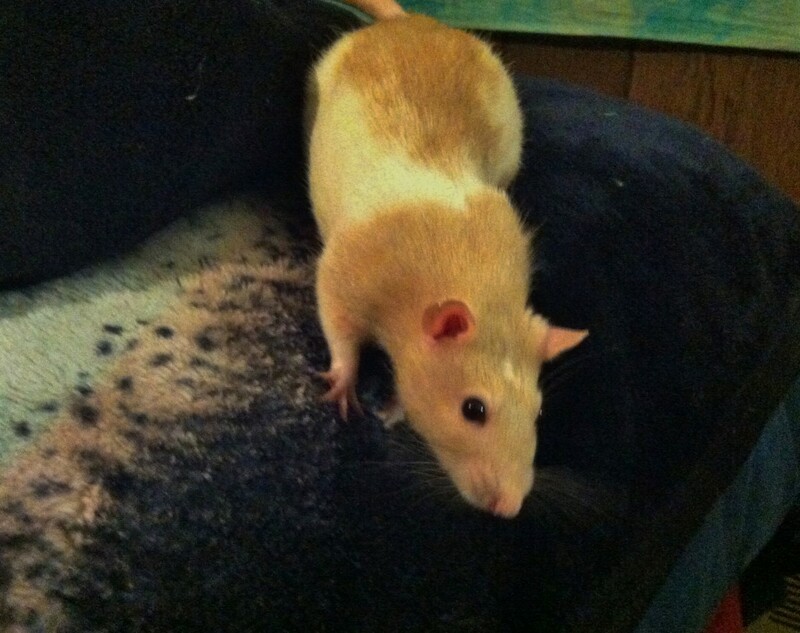 My two-year-old rat had to be put to sleep. Now his littermate looks lost on his own. How long should I wait to get him a friend? Also, all the rats I can find are twelve-weeks-old. Is this too much of an age gap? Not necessarily. A lot of adults rats are accepting of younger cage mates! Every rat is different though, so you would have to watch your adult during intros to see how he reacts. Sometimes introducing two older adult males can be more difficult due to territorial behavior. I wouldn't say there's a specific waiting time before finding him a new friend. Just be diligent during intros - having your hand close by your adult can help in case you feel you need to stop interaction fast. I had 2 females, aged around 2 1/2 to 3 years. In May, my more outgoing girl had an unexpected stroke, and she passed away. I am now left with 1 girl who is very timid, she doesn't love being handled, and freaks out when not inside cage. I would LOVE to get 4 young girls, but I worry that my current will either be picked on or may be mean toward the newbies out of fear. How should I go about introducing the dogs in this situation? Are there other methods that can be used to reduce my oldie's stress? Can you lure her out with treats, maybe something especially appealing like tuna, peas, etc? If she loves treats, maybe you can get away with her having a lot of snacks during intros with potential new girls. I've never introduced a baby to an older rat until today and didn't do my homework. I just put a six-week-old baby in the cage with my older one-year-old female. They are both females, and my older rat is very aggressive, and I don't own a second cage. Do I just keep a close eye on them, or do I go purchase a cage and do the introduction the long way? I would get a second cage to keep the new rat in while you do introductions. I've even used an old birdcage after zip-tying the food and water access doors down. While your rats could end up getting along, throwing them together in a cage where your older has been dominant and alone until now could result in aggressive behavior. And unless you can watch them 24/7, you could easily miss a moment where you would need to intervene on behalf of the younger rat. I got two rats about a few months ago, and they have been together since they were small babies, so they are used to each other. I was thinking about getting another baby rat, but I don’t know how the other two rats would react to the new baby. I only have a small cage so the baby wouldn’t be able to stay in the cage for long. I’m scared the other two might not like the new rat. What do you think I should do? Younger rats are more likely to accept a new cage mate than adults, so it may work out just fine! 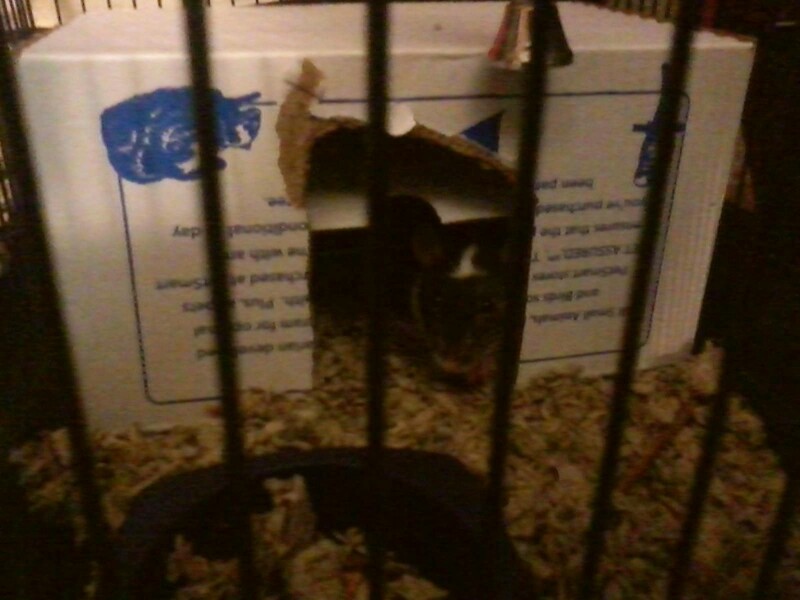 Even if the temporary cage for the new rat is small, it would only be in there until introductions are complete. You won't really know until you try, but since they are still young, they may accept a new rat well! Can a two-year-old rat become friends with a two-month-old rat? Absolutely! Has the two-year-old ever had a rat companion before? That would definitely help with introductions. If the rat has been alone its whole life, you may have to take introductions more slowly, as the rat will have never known companionship before. It isn't guaranteed that the two rats will get along - aggressive rats do exist - but most rats enjoy having company. Is it likely that a rat which has been aggressive in the past will be aggressive towards new rats? Sometimes new owners do return rats for being "aggressive" when they didn't know how to bond with or handle them - it's happened before. But if she was being aggressive toward other rats, I'd be wary. She could just be aggressive toward other rats, and may do better as an only rat. If you do decide to adopt her, I'd have an extra cage on hand to keep her in, both during intros and in case she won't bond to your girls. I'd also be careful during introductions (and take it slow), in case she does display aggressive behavior. I have a rat that's about six-months-old and my friend just gifted me a little guy that seems maybe two-months-old at most! The size difference alone makes me nervous about an introduction. Will an older male rat be more accepting of a younger rat or do I need to be worried more than usual? All rats are different, but most of them are accepting of a cage mate. Your older boy is technically an adult at six months! He may be fatherly toward the younger one, but it's hard to know without intros. You can try taking the process really slow and seeing how they both react. If at any point you feel uncomfortable with how things are progressing, you can stop or take a step backward. I have a 2 year old male rat who just lost his cage mate. I bought two 4-6 week old male rats and introduced them two days ago. The older rat shows no aggression, they cuddle together, the babies crawl all over him and groom him and hide under him. I have left them in the same cage for about 12 hours now and they have not had a problem and mainly sleep and cuddle next to each other. Is it safe to leave them overnight, or is better to separate them until the babies get older and bigger? If you are feeling uneasy, you can always keep them separate at night for a couple of weeks (until they get bigger), and put them together when you are around during the day. Or you can wait until you will be home all day and monitor their behavior. But if you've introduced them step by step and he's shown no aggression, things are looking good! We adopted two rats last week and we're going to get another one (from the same place and the same colony). Do I have to follow all of the steps of introducing a new rat again, even though it's only been a week since they were together? If it has only been a week, it shouldn't be a big deal! If for some reason they have any issues when you put them together, you can go through with intros. We have two male rats; one is a year old, and the other is three-months-old. We’re thinking about getting another rat, but is a single more likely to get picked on? Would it be better to get two new ones? A single rat won't necessarily get picked on more than two new rats. However, getting two new rats would ensure that the new rats each have a friend when the older rats pass away. It's sad to think about, but would give the new boys each a guaranteed friend! I will be re-bonding one rat with cage guard with two of his brothers, but they have been separated for a month. Should I follow these steps, but do playdates on their own first? I think it's definitely worth following these steps, even if they were once together before. I also agree with doing separate playdates first as well - see how the one rat gets along with each of his brothers separately first. If he's doing well during one intro, you can try to introduce the other brother and see how it goes also! My rat Reba recently died unexpectedly, and I have another rat named Mama. Mama has always been clingy but seems more so lately. I’m not sure how old mama is. She’s an adult rat and has had several litters. I’m a college student, and I’m at school late. What should I do? Should I get another rat? If so, how old? This is always a tough question. Rats do sometimes mourn the loss of their companions. If Mama is over two years old, she may be elderly herself. When our first girl passed, we just gave our second girl lots of love and attention until she passed peacefully many months later. You could get Mama a new friend, but you may need to do intros first to make sure they get along. She would potentially be motherly toward a younger rat. If you go down that route, you may want to get two new rats instead of one though, so the newcomers have each other when Mama passes away. It's a sad thing to think about, but you are a loving rat-parent no matter what you decide to do. @Rachel Dominance is a common thing among rats - my two boys challenge each other often! They aren't aggressive toward each other, so it doesn't mean your boy will act that way. When I introduced my first girls years ago, I put some tuna on a plate for them to snack on together. Before putting them both down, I dabbed a little tuna water (from the open can) at the base of each of their tails, so they would smell the same. Since my resident girl was obsessed with trying to smell the new girl's scent, it seemed to calm things down - then they got to share the tuna together! I have two 1.5 year old boys, and I want to get some 2 month old babies. One of my boys likes to try and dominate other rats, so I'm worried he'll be aggressive. Is there any trick that will help? @Jordan Oh, she's still young then! She will probably take well to a new friend. And that's great that you found that breeder - you'll have the cage to keep the new rat in until they are fully introduced. I wish you and your rat(s) all the best as well! @Jordan In the end, this is really up to you. How old is your remaining rat? If she is still fairly young, she could benefit from having a new cage mate. With my last pair of girls, they were so elderly that when the first one passed, I didn't feel like it was fair to try to make her bond with a new rat. If your girl is older and you want to do this, I'd suggest getting two new cage mates. That way, when your older girl does finish living her best life, the new cage mate isn't left alone and you don't have to repeat the intro process. Hello, I was just wondering if you could help me? Unfortunately, one of my two rats has died today very unexpectedly as she was extremely healthy, active and had an amazing appetite. I was just wondering if I should get a new cagemate for my remaining rat as she has become skittish and quiet but still eats & drinks. Though Before the unfortunate passing of her cagemate she was normally shy but love to get handled and fed treats! I would love to get her back to her somewhat normal behaviour/State, but I worried about a relapse happening with the new one. Also, I don’t have a lot of money so I’m at a loss of what to do as of getting a new encoler & equipment. Unfortunately, intros can't really be rushed, especially with older rats. It's possible it may only take a week or two for him to bond to a new rat, but every rat is different. If you like, you can simply try to spend as much time with him as possible to help him feel loved. If you did get him a new cage mate, you might want to get two so that you don't have to repeat this process when he passes. 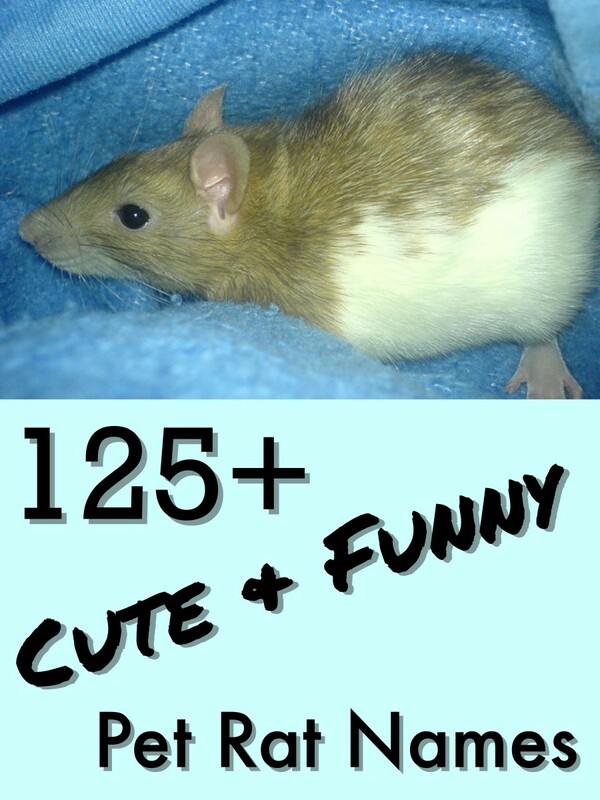 He's also elderly in rat years, and may not be as energetic as he used to be. Looking for advice: We adopted our son and his girlfriend's three rats as she developed an allergy. About two months ago, one of the little guys passed away in the cage (respiratory). Yesterday, we had one of the boys euthanized (he was full of cancer and we didn't want him suffering). We are now left with one, and he only wants to sleep. He is eating but barely. We have brought him out to cuddle with me or with my husband, but all he does now is scurry under a throw cushion on the couch. We really don't mind getting a new cage mate for him, but we don't want to have to wait a month or longer for introduction. Is there something we can do now to help him out - to give him company possibly? If it's important to know, our guy is about 2.5 years old. @Nicole Maybe give them a few days to wind down and try again? They may just need to adjust to change, like when rats first enter a new environment. Since I'm guessing your friend's rat has her own cage and everything, there's no rush to get her integrated into your existing cage. Maybe just take a break, try again, take it slow and see if things improve. If time passes and your girls really don't seem willing to accept your friend's rat, you could always keep them separate, or find a new home for her. @Claire It is definitely possible, as long as you follow an introductory process and take it slow. My first ever rat was somewhere around nine months old when we introduced her to another female, and they ended up being best friends. All rats are different, but since your boy has already had one companion, I'd say it's worth a try! I had two rats but one got sick and died right before his first anniversary of being at my house. It seemed like my other rat, (who is also male), was lonely. So we where thinking about getting him a new friend. He is past his first “birthday” at my house so I came here looking to see if I could get him another, younger, furry friend. @Abigail I've introduced rats successfully in the past. He's still young - if you introduce them gradually and follow the steps, it will likely go well. All rats are different, but I have yet to have a rat that wouldn't accept a cage mate. When I adopted my two current boys, I learned that they had a brother that had to be separated because he was bothering one of them to the point of stress grooming. While my two boys do have daily dominance scuffles, that one no longer stress grooms, and his fur has grown back. I think all rats deserve a chance to have a friend! 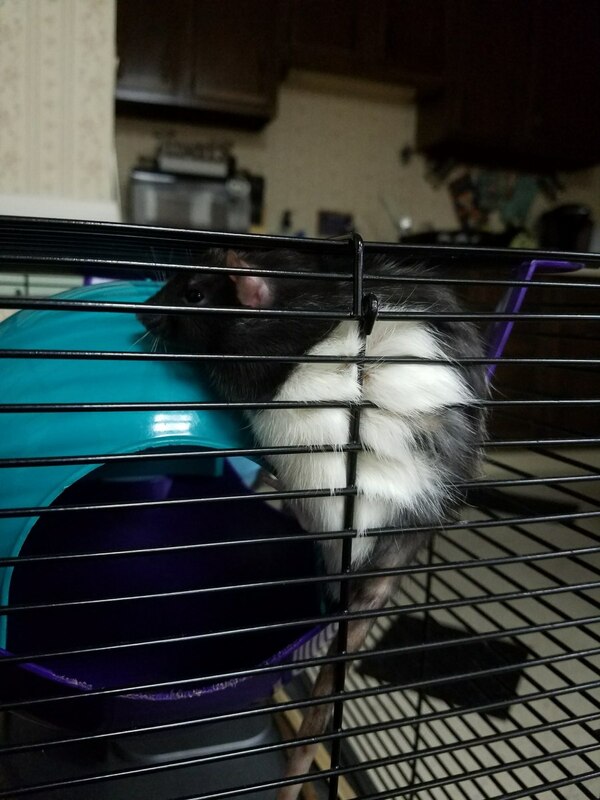 I’ve had Rorschach for about a month and want to get another rat. Is he going to be territorial to the point of fights? I don’t know if he’ll want to fight because he’s normally pretty lazy but this is different. @Brendan Did you clean the cage thoroughly beforehand, and moving the items inside the cage around? That can help Pistachio feel like they are in a new cage that doesn't "belong" to them. It also could have been a common dominance fight - my first two girls used to "box" each other while standing on their hind legs often. I’ve had Cashew for about 2 weeks now(medium rat) and pistachio(large rat) near each other. I put cashew in pistachios cage and they started fighting? There was squeaking and they both stood on their hind legs. I broke it up because cashew is much smaller than pistachio. I know they stand up like that when they actually fight but I could not tell. @Hannah Patches was at least five months old (if not more) and Gadget was a couple of months - she had been sitting at our store for a little while, getting passed over. I think you'll be fine introducing a new female rat to Remi, as long as you take it slow. Being younger might help with introductions, but Gadget wasn't a tiny baby when we got her, and it still worked out. How old was Patches and Gadget when you introduced them? Currently I have a 5 month old female rat, Remi, and I didn't get her a companion when we originally bought her because the vet told me she was a male. Now that I'm 100% confident Remi is a girl, we want to get her a sister. Does the younger they both are help with introductions? @Aj That's exciting! I hope your introductions all go smoothly. I have had a girl rat lily for a month and I am getting another one for her to have a companionship this was really helpful to me. Now I know how to introduce my new rat when I get her. @Sherry I just saw this! You're welcome - I'm glad this could help you. Thank you so much for this. We had two rats, Iris and Zaya, but last night Zaya died quite abruptly and I was looking to see how to introduce a new one. I would personally like a little more time to be sad but I know that Iris really needs a companion so we will probably get one from the same breeder tomorrow. Thank you for this great advice! @Teagan I'm sorry for your loss. It's a really decent cage for the price! It also held up pretty well - I only had to replace it once when my (bratty) rat ate a hole through the plastic base. Had to get a little creative to keep her from doing it again. Hello! This is very useful. One of my boys died and we had only two. So now one is left. We had bought him a friend, but the new one ended up being a girl. So now we have to get her 2 babies to go with her and him 2 boys to go with him. I also noticed that you have the same cage as I do! Really cool. @Lisa That's wonderful! So relieved they are getting along now. I remember how happy I felt seeing my first two rats cuddling in the cage for the first time. I'm sorry one of your rats passed away, though - it's a rough thing. AH MAZING!!!!! Thank you so very much!!!! This worked! 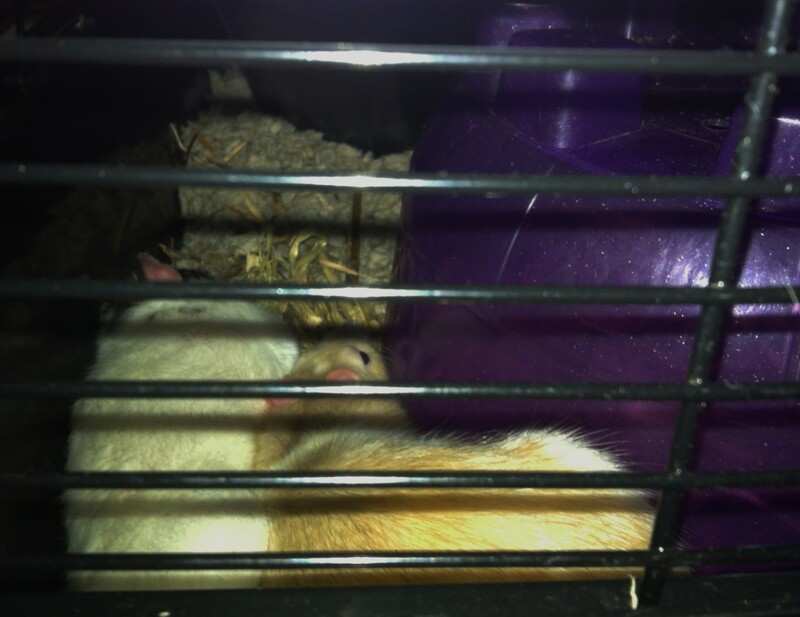 My two daugher's each had a female rat who live together for 11 and then the one who belonged to my younger daughter (10 yro)passed away due to respiratory issues. 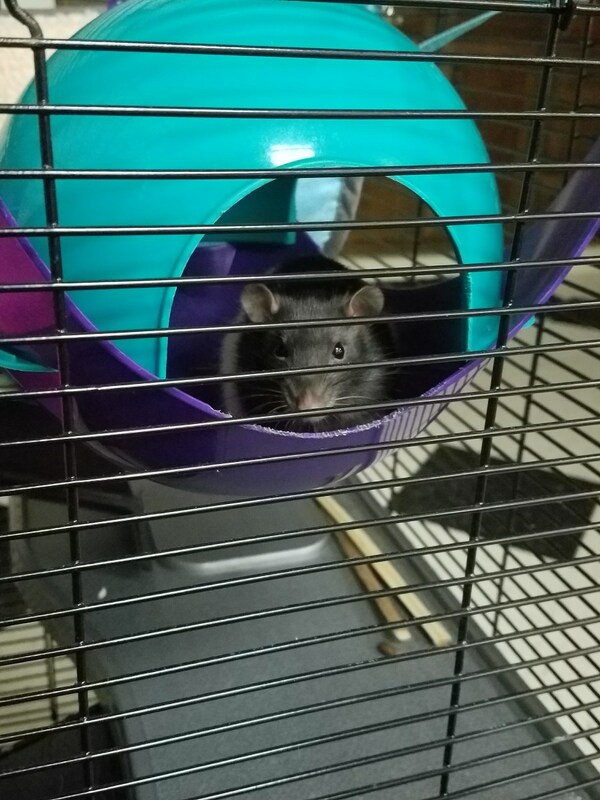 My husband felt bad and went and bought her a new rat the very same night and put the new littler rat right into the cage. It did NOT go well at all!!! The resident rat is larger and bullied the new rat all night. Isis(the resident rat) was coming up to the new rat Pancake huffing at her, pushing the bedding up towards her & tried to bite her. She also took all the food from her and even out of the food bowl downstairs, upstairs to a corner to hide it just so Pancake wouldn't have any! My oldest daughter tried to detour Isis by squirting her with a water bottle, which worked until we weren't looking. It was a very long night for everyone! 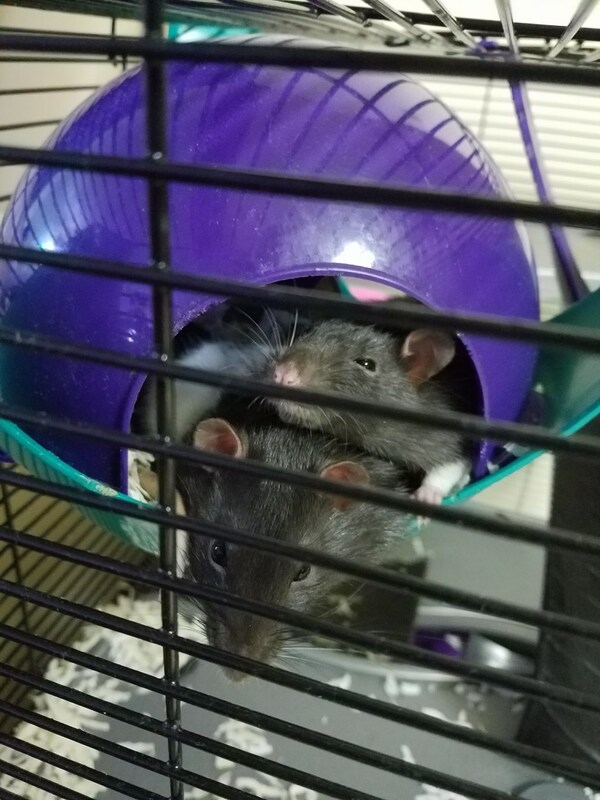 I was stressed, both rats were stressed, my kids were stressed! Then next morning I found this article!!! It worked and within 2 days! @debi166 Hey, I'm not sure if I mentioned this in my hub completely: have you tried feeding them tuna during their time in neutral territory? What I remember doing was having tuna out on a plate (like in the picture) for them to snack on. But I also took some of the water that comes in the tuna can and dabbed it at the base of their tails. I had read that it helps mask their own personal scent. Suddenly the new rat smells like the old rat! And hopefully they'll be so focused on tuna that the dominant girl doesn't get so worked up. Maybe try it one session and see if it helps at all? We are having a problem with a dominant rat, we recently got a new rat because one of our two resident rats is sick and I didn't want the other to be alone if we lose the sick one. The dominant rat is a little over a year old and the new rat is probably around 4 months old. Our first introduction went bad very quickly, the new rat was bit right away. So we took a few steps back and have been socializing on neutral turf which sometimes go well then other times Tyanna (dominant rat) puffs up and goes after the Lotti (new rat). Lotti yells but I break it up right away. @Chloe I've never had a pack of three before, but I would just keep an eye on them for a little while. Are they in the same cage yet? A healthy amount of dominance fighting is okay - like you said, it's to be expected. There will always be dominance scuffles, like wrestling, boxing, pinning, or even mounting. But if it seems like the little one is being bullied, is shrieking like she is in pain, or blood is drawn, something is definitely wrong. My first pair used to fight and box a lot more than the girls I have now, but they still pin or mount each other from time to time. @Klae I'm glad it's been helpful! Just take your time and don't rush it. I hope they take to each other soon. Hi! I found this super helpful because I'm currently in the process of introducing a baby female (9wks) to my older female (1.5yr) and its been lengthy - plus it makes me so nervous when I hear the small one making squeaks! I hope they'll be the best of friends, I felt terrible about having my lone female for a while. @Kim It's a little belated, but I'm glad I could help! Love the article! I'm currently getting a new rat used to my older rat. The process is going good. It's nice to know what is playing and not actually fighting. Thanks for the help! Thank you for reading! 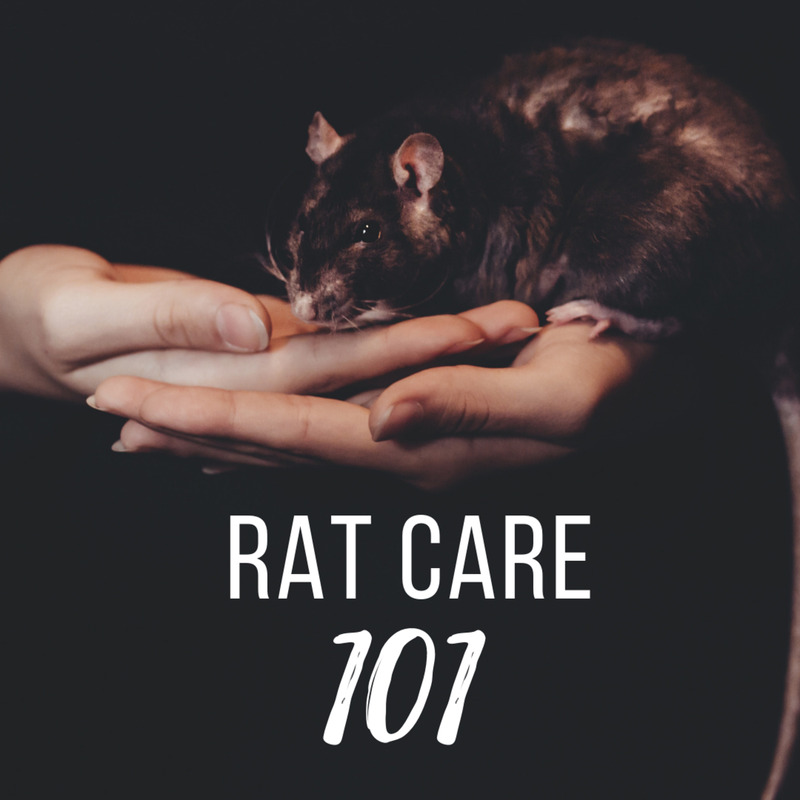 Believe it or not, you do need an introductory process for pet rats that aren't from the same litter; just like with other pets, they won't always get along. Thanks again! Hi Dreambowl, I was reading your article and glaring at the words on my computer screen saying to myself is this for real, or a fictional story. I kept reading and I discovered this is real! Very well written, and congrats on being selected as an apprentice for November. @Lori: Thank you! A lot of people don't realize the care that goes into owning rats, especially introducing a rat that is from a different litter. I appreciate the comment! And rats have fantastic personalities. Nice article. It should be a lot of help to anyone wanting a pet rat. Taking care of a pet rat is as important as any other pet so what a good hub ! My daughter had a rat and she liked it's intelligence and personality.